SRS account help you save 2015 tax if you contribute before 31 Dec and what to invest using your SRS saving! Did you know that you could enjoy some tax advantages in this process? This article takes you through what the Supplementary Retirement Scheme (SRS) is about, and the tax benefits available if you choose to save for your retirement via this scheme. It is a voluntary savings scheme introduced by the Government to encourage individuals like you to save more for retirement, above what you contribute to the Central Provident Fund (CPF). · Both you and your employer can contribute to your SRS account. 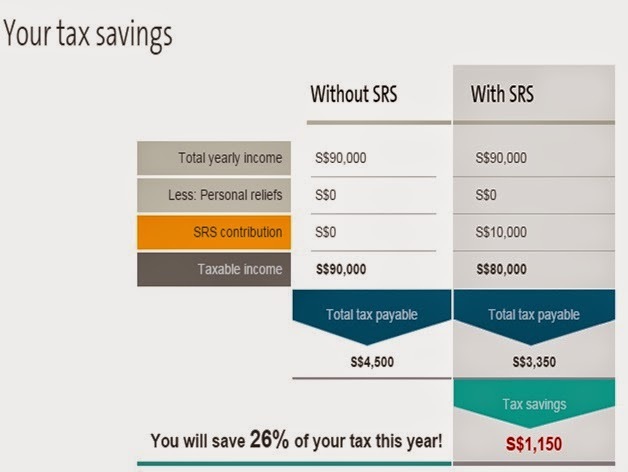 · Contributions to SRS are eligible for tax relief if you are assessed as a tax resident. · You can invest the funds in your SRS account. · Investment gains are tax-free before withdrawal. · Only 50% of the withdrawals from SRS are taxable at retirement. Is the SRS suitable for me? The SRS is intended to help you save for your retirement. If you choose to withdraw your savings earlier than the statutory retirement age, you will have to pay tax on the full withdrawal and a penalty of 5%. Therefore, when considering whether to participate in the SRS, you should review your financial circumstances to ensure that you do not need to draw on your SRS savings until you reach the statutory retirement age. How much tax savings can I have? How do I participate in the SRS? You can open an SRS account in person at any branch of the Government-appointed SRS operators, as long as you are at least 18 years of age and not an un-discharged bankrupt or of unsound mind. Currently, the three SRS operators are DBS, OCBC and UOB. What can I invest my SRS savings in? The SRS savings in your account can be invested in a variety of financial products, including those offered by financial institutions (product providers) other than your SRS operator. You should note however that the SRS scheme does not guarantee any specific rate of return on your investments. Your actual returns will depend entirely on the investment choices you make. Direct property investments are not allowed and certain life insurance products are subject to restrictions. Suppose you start contributing when you are 30 years old and save up to the contribution limit of $12,750 each year until you turn 62. If you achieve a 5% annual rate of return through your investment choices, your savings could grow to $860,000 in your SRS account by the time you turn 62. However, if the performance of your investment is not favourable, you may incur losses. In comparison, if you had kept your money in a savings account that offers an interest rate of 0.5% per annum, you would have accumulated about $400,000. You and your employer may contribute to SRS at any time of the year and as often as you wish, subject to the maximum SRS contribution for the year. To be eligible for the tax relief, all contributions whether in cash or by cheque deposits must be made or cleared by 31 Dec of the year, or as specified by your SRS operator. The maximum SRS contribution for a Singaporean/Singapore permanent resident and foreigner are $12,750 and $29,750 respectively in the year 2013.